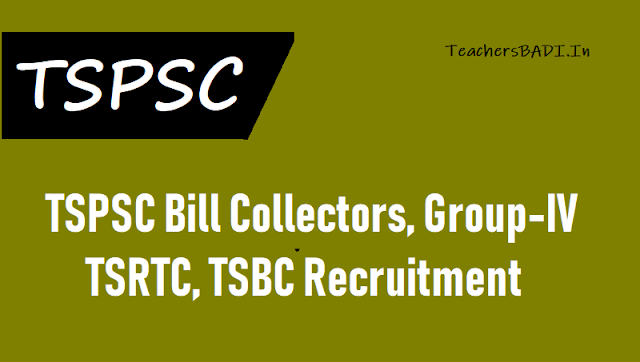 TSPSC Bill Collectors, Group IV, TSRTC, TSBC Recruitment Results 2018, TSPSC Bill Collectors, Group-IV, TSRTC, TSBC Recruitment Hall tickets, Exam dates 2018: TSPSC Bill Collectors, Group-IV, TSRTC, TSBC Exam date notification: The candidates who are applied for the post of Bill Collectors in GHMC, Group-IV services, TSRTC Posts in Telangana State and Telangana State beverages Corporation vide Notification No.17/2018 10/2018,11/2018 & 18/2018 respectively, that the Commission decided to conduct common Examination for above said notifications which is tentatively decided to be held on 07/10/2018, as the required qualifications and Syllabus & Scheme of the examination are same. TSPSC Bill Collectors, Group-IV, TSRTC, TSBC Hall tickets : Telangana State Public Service Commission, TSPSC has released the hall tickets for the combined examination of Group 4, JA in RTC and Bill Collector in GHMC and Various posts on tspsc.gov.in. The direct link to download TSPSC Group 4 Hall tickets is provided below. Candidates are advised to download the hall tickets from the official website tspsc.gov.in at the earliest using their TSPSC ID. Link to check TSPSC ID also provided. TSPSC Group 4 Exam 2018 is scheduled for October 7, 2018. Candidates would require their TSPSC ID to download the hall tickets or admit card for the recruitment examinations against Notification No's. 10/2018; 11/2018 ; 17/2018 and 18/2018. Steps and link to download TSPSC Group 4 and other Hall Tickets: Go to the official website tspsc.gov.in. On the home page, click on the link for the TSPSC Group IV and other Hall Ticket Download Notification. A new window would open. Enter your TSPSC ID and Date of birth to login. Your hall ticket would be available on the page to download. The Telangana State Public Service Commission (TSPSC), Hyderabad has released the hall tickets of candidates who have applied in response to notifications for Group IV Services (Notification Number 10/2018), Junior Assistants in TSRTC (Notification Number 11/2018), Bill Collector in GHMC (Notification Number 17/2018), and Various posts in TSPC, Telanagana State Beverages corporation Limited(Notification Number 18/2018). The hall ticket is for recruitment to the post of Group IV, JA in RTC, Bill Collector in GHMC and Various posts in Beverages Corporation (General Recruitment). Candidates can download it by clicking on Hall ticket download here. The hall ticket should be kept carefully for future requirements at the time of certificate verification etc. The exam is common for the posts mentioned above. Steps to download the TSPSC hall ticket: Visit the official website of TSPSC at tspsc.gov.in. Click on the link for ‘Hall ticket Download for Notification nos. 10/2018 , 11/2018 , 17/2018 & 18/2018’. Enter your TSPSC ID and date of birth. Click on go. Admit card will be displayed on the screen. Download it on your computer and take a print out of the same. Note: Visit the official website of TSPSC for latest news and updates.